Stranger Things actors have scored massive hike in their salary with Netflix ahead of season 3, which is 12 times of their previous deals. ‘Stranger Things’ kids have already built fortune and fame from Netflix originals sci-fi drama. Wondering how much is Stranger Things cast salary is? The cast of the Emmy-nominated show, who are mostly teenagers have cracked themselves a hefty hike in their salaries ahead of the sci-fi drama’s third season. The salaries of ‘Stranger Things’ kids will make all of us think what we were all doing at this age during our time? Hold on your breathe, you may skip a beat after we reveal you the salary of each actor of Stranger Things is going to make from an episode for season. Streaming giant Netflix has agreed to pay the Stranger Things stars between $150,000 to $350,000 an episode for season 3. According to sources, the kids have renegotiated their salaries successfully with Netflix Originals ahead of Season 3 which will begin filming on April 23. The Stranger Things kids have roughly cracked themselves a contract which is 12 times higher than their previous deals. Forbes’ Highest Paid Actors: Mark Wahlberg Leads, SRK, Salman Khan, Akshay Kumar Make It To Top 10! The actors of season 3 are divided into three different categories based on their role and new salary negotiation. “A tier” includes Winona Ryder (Joyce) and David Harbour (Jim Hopper) actors who will get paid as much as $350,000 per episode. 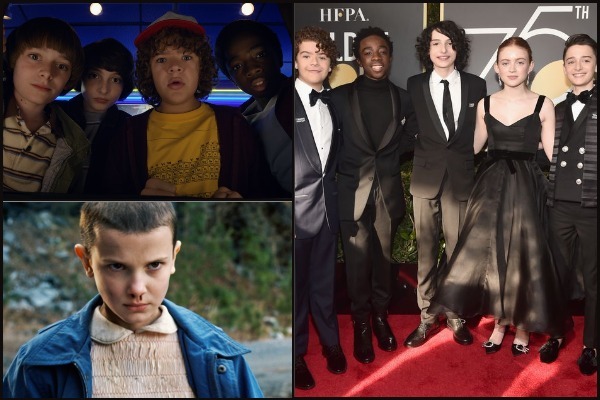 The “B tier” consists of the young stars — Finn Wolfhard (Mike), Gaten Matarazzo (Dustin), Caleb McLaughlin (Lucas) and Noah Schnapp (Will) — who are each collecting $250,000 per episode. Onscreen teenagers Natalia Dyer (Nancy), Charlie Heaton (Jonathan) and Joe Keery (Steve) who fall under “C Tier” are apparently taking home $150,000 per episode. Did you notice, 14-year-old Millie Bobby Brown, who plays Eleven is missing from the list. It is reported that her pay hike is still kept a secret, which we bet cannot be less than $250,000 of her child co-stars, or possibly she has negotiated for as equal as “A tier” actors. Although, we do not buy that Millie must be making as much as Oscar nominated actress Ryder from “A tier” who is on silver screen from last three decades. Not less not more, Millie Bobbi Brown mus be minting in between adults and kids range, making her own tier with $300,000. The child actors started with $20,000 for the first and second seasons of the series, whereas Ryder was earning $100,000 and Harbour’s at $80,000. The success of previous two seasons and award nominations have leveraged the cast to renegotiate their salaries at a whopping 1,150 percent more than what they were previously making on the show.